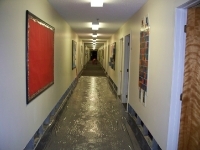 Assess and evaluate water damage cleanup. 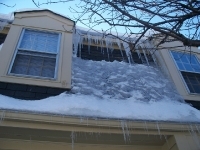 Contact insurance company if damage is covered. Begin water restoration service by wet floor extraction. Remove flooring if necessary or contaminated. Remove baseboard if necessary or contaminated. Ventilate wall cavities to dry, or remove if contaminated. Treat structure with an anti-microbial to inhibit mold growth. Set dehumidifiers and air movers to dry structure and prevent mold. Monitor drying equipment daily to check progress. Replace all drywall, baseboard, flooring and paint if necessary. Water damage, water removal, and the clean up that follows can be very quickly done and the cost associated with it is relatively low, when compared to the cost of mold remediation if the dry out is not taken care of properly. Water damage repair usually will involve carpet, baseboard, and sometimes drywall. Often basement water damage occurs from sump pump failure, or toilet overflow from a back up, and sewage or contamination is usually a problem to deal with at this point. Drywall water damage can usually be dried out and saved unless it involves sewage water damage, or unless the ceiling is involved in some cases. As a professional water damage company, we will access the damage, and inform the customer of the procedure that will need to be followed. Whether it is house water damage or commercial water damage, Capital Restoration will be able to restore your property to a pre-loss condition faster than any of the other water damage restoration companies. We can help with flood damage, by pumping out the water, so you don’t end up with water damage mold. Water Damage Clean Up can be billed directly to your insurance company without any cost directly out of your pocket other than your deductible. As a restoration company, we can assist you with all your damage restoration needs. The flood was just the beginning. Without prompt attention, the damage will almost surely grow. Rot. Mildew. And worse. With proper attention to detail, water damage doesn’t have to cause a flood of other problems. By seeking our Water Damage Restoration services as soon as possible, we can help you to avoid the further consequences. Clean Water – Clean water is water that does not contain harmful contaminants. Clean water damage most commonly from rainwater or a burst pipe. Gray Water – This is where there some level of contamination in the water. For example, when a household appliance floods over (e.g., washing machine, dishwasher, empty toilet, refrigerator). What does water damage restoration consist of? Water removal and extraction. Even if the water is above grade and is contaminated, it may not be wise for you to allow it simply to flow outdoors (although you may not want or be able to prevent it). If the water is below grade, you should have it promptly removed and properly disposed of by a reputable service. Like us. Then there is the sopping mess on and under your floor. There’s hope for your wet carpet, and your water-damaged wood floors (that are surely already swelling as you contact us!). It’s usually more cost-effective to do water damage restoration on a floor than to replace the damaged floor. The sooner you call us, the better the chances. Treating damage above the floor. Upholstery, draperies on the wall, and the drywall itself should all be checked for water damage. Even if the water wasn’t deep, it may have travelled up. Our professional Fabric Restoration services will renew the beauty and appeal of your now-wet upholstery and other cloth goods. If wet drywall is salvageable, we will expertly dry it. If it is beyond saving, our flood-repair specialists will remove damaged portions and replace them, doing an expert drywall repair. Controlling flood damage odor. The water smelled. Mold smells. Fungi and bacteria smells. Maybe even the wet dog smells. That’s why Odor Control and Mold Remediation is an important part of a professional flood clean-up. It’s not just the smell. These factors can also cause you health problems, well into the future, if they are not properly controlled. 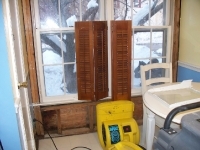 As a full-service water-damage restoration service, CAPITAL RESTORATION can also handle odor or mold problems where someone else did not attend them, or handled them incorrectly.